Thailand is located at the centre of the Indochina peninsula in Southeast Asia. It is bordered by Burma, Cambodia and Malaysia. Thailand is the country most visited by tourists in the Southeast Asia and this is for good reason as it really does offer something for everyone. Exotic jungles, tropical climate, amazing food, beautiful beaches, fast-paced cities, and an abundance of cultural offerings – Thailand is a perfect holiday destination. Plus, there are plenty of flight offers owing to its popularity and once there, it is very affordable. Considering the size of the country and all it has to offer, decide on when, where, how and in what order can be confusing. Take a look at trailfinders guide to Thailand holidays to work out your route around this amazing country. 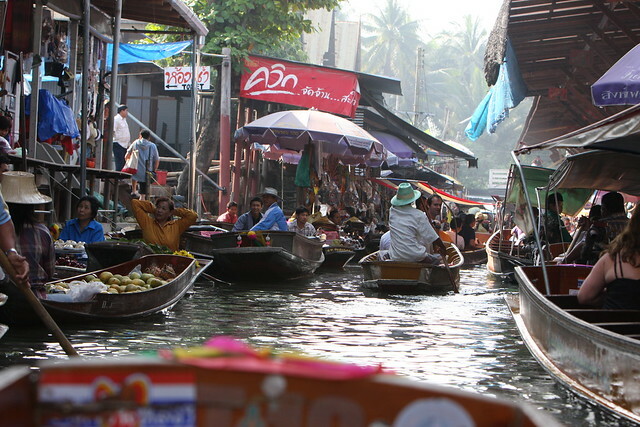 A quick visit or stay in Bangkok is definitely worth planning in around your arrival or departure from Thailand. Bangkok is quite simply a massive city – crazy busy and crazy fun. By day, explore all that the city has to offer – take a traditional Thai massage, explore the fantastic markets and shopping malls, and be sure to experience the mouth-watering local cuisine – there are many places to take a Thai cooking course too! The city also affords plenty of opportunities to visit temples and experience the rich Buddhist culture. However long your stay, there are plenty of day trips to be taken from the city; visit the infamous bridge over the river Kwai or take a luxurious Eastern & Oriental express rail journey taking in delicious food, stunning views, all in your own private cabin. By night, the city is alive with excitement. Another popular destination whilst visiting Thailand is the island of Phuket, an island off the south-west coast of Thailand. The largest of Thailand’s island, Phuket affords idyllic beaches combined with the infamous nightlife of Patong. Once in Phuket, a very popular excursion is to go island hoping. You can easily travel to Koh Phi Phi, where the film “The Beach” starring Leonardo Di Caprio was shot, by a speedboat tour. Chances are that Thailand’s beautiful portrayal in this film is what drew you to a holiday here in the first place. Further, a half day safari tour of the island is fun for all the family combining a Thai cooking demonstration, an scenic elephant ride, and a chance to canoe the calm waters of the glorious shoreline.